staring at people, imagining doing all the things i wanna do. what if i went over right now and straddled him? What would he do? Would he wake up? feel alive? do you see? do you see? There’s only one way to find out. I say go for it! the thing is, the person I was looking at wasn’t even attractive. it just some guy, sitting there, all blurry and vague, just like the picture. but I wanted to make him sharp, bring him in focus, give him the world of colors and smells and sounds. not for any real reason but that he was blurry, weak, barely a blip on the register. it’s these unnoticeables that I notice. god, i love the train. straddle which guy? 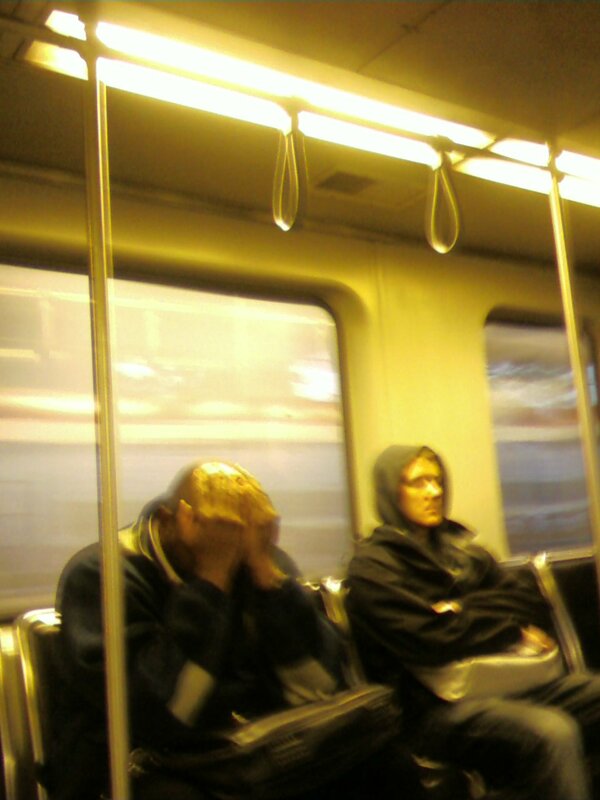 The guy in the Unabomber costume, or the guy who glued his hands to his head?